Hello, good evening and welcome to this week’s edition of the MIS Online newsletter. This week we bring you news that Carl has announced the title of his forthcoming solo album. Due for release at some point in 2014, the album, entitled “A Comfortable Man”, will be filled with his own personal compositions. You can rest assured in the knowledge that as soon as we hear anything further relating to this project we’ll be sure to let you know. In Suggs news, it seems that www.SuggsMcperson.co.uk is now under development. Linked from the main man’s Twitter account, it’s possible that it’ll become active in the run-up to his book launch. www.SuggsMcpherson.me was a previous web site of our favourite front man, featuring lyrics and photos during his solo career. As with Carl’s project, we’ll be sure to let you know if anything further. Suggs My Life Story, the West End of London December Run. December 1st – Garrick Theatre, London’s West End. December 8th – Garrick Theatre, London’s West End. December 15th – Garrick Theatre, London’s West End. December 22nd – Garrick Theatre, London’s West End. October 31st (Halloween) Jazz Cafe, Camden Town. *** NEW *** Friday September 13th. – Part of The Number 6 Festival. Portmeirion Wales. First airing of solo songs, at The Town Hall, in a slot run by composer Joe Duddell adding strings and harp to the songs. This edition is retailing at just over £5. Fu Man Chu has been made into a 7 inch vinyl single. Pressed as a limited run, and licensed for sale, it’s predominately created for the DJ Japan market. But ,if you want to grab one phone Rads on 07940293945 to confirm and you’ll be given the address to send money to. Say’s our own Paul Rodgers who purchased one this week, displaying it on facebook. It comes in a yellow label with Axe Attack recordings as the heading. 2 mixes are marked as FuManChu (Intro) and FuManChu (Toast). Following the sell-out of the Gogglebox box set, the Madness movie has been sadly unavailable. From October 7th it’s back, thanks to those lovely people at Salvo sound and vision. This is being re-released for the first time with a nearly complete soundtrack CD of all the tracks from the movie, including a couple of old rock and roll numbers by the original artists. Namely Fat’s Domino, and The Four Tops, along with all of Madness’s tracks which are heard throughout the movie. There’s new packaging for this re-release which will be available from music stores and online outlets, for under a tenner. This release also and contains a booklet containing information about the film. The more observant of you will notice that unfortunately See you Later Alligator doesn’t feature, and Sunshine Voice has also failed to surface from the Madness archives. We understand the compilation will be celebrated with an event screening at The House of Fun Weekender later this year. A conga line “One Step Beyond” T-shirt, a blue nutty train, and hearts “It Must be Love” design are new to the Mad shop. Reviewed in issue 743 of the MIS, this latest edition of Ian Taylor’s Madness/Ska-zine spans a whopping 70 plus pages and features a CD covermount in the form of “Here Today, Gone Tomorrow”, by Too Many Crooks. Priced at a mere £5 delivered (for UK readers. Those oversees will need to check), this is amazing value for money and is absolutely bursting with content. Hopefully, the bigger response Ian gets the less of a wait we’ll have until the next issue surfaces! Last week Complete Madness re-entered the top 200 at number 167 to clock up its 104th chart week on USM. That’s two years to you and me. Two years in the top 200. That’s 104 weeks from a possible 230 since it was released. Highest placing was 38 on 30 May 2009 (the same week Norton Folgate was number 5). Average position (when on chart is 138). It first charted on 28 March 2009. It has spent one week in the top 40, ten weeks in the top 75 and eighteen weeks in the top 100. If combined with the Stiff original the stats are: three weeks at number 1, ten weeks in the top 5, nineteen weeks in the top 10, forty three weeks in the top 40, eighty one weeks in the top 75, one hundred and six weeks in the top 100 and one hundred and ninety two weeks in the top 200. NB all chart placings between 101 and 200 have been scored by the 2009 release. With USM having signed a new distribution deal with Sony DADC (the company whose warehouse was disastrously burned down during the London riots 2 years ago) it looks like there will be many more chart weeks to come for Complete Madness. This week, MIS co-editor Rob Hazelby, goes back 5 years to issue 485, and the week of Sunday 17th August to Saturday 23rd August 2008, and then back 10 years to issue 223 and the week of Sunday 17th August to Saturday 23rd August 2003. It’d been a long time coming, but we received the news revealing that last month the US had finally received an official re-release of the legendary One Step Beyond album. US-based Rhino.com were certainly pleased with the news, and had put together a rather nice press-piece to commemorate the re-release. Not surprising really, as they were the ones (Rhino Encore) who’d re-issued it. On to podcast news next, and somewhere between the feel of a Louis Theroux documentary on Madness obsessives and one of Michael Palin’s constant travel shows, we brought you ‘euSKAra in Bilbao’ our 2nd MIS Podcast. Following our epic 3 part Hackney podcast, in which we packed over 30 fans and some band members to cover that amazing event, we kind of got into the idea of Podcasts, and this latest production was now available for download from the MIS web site. 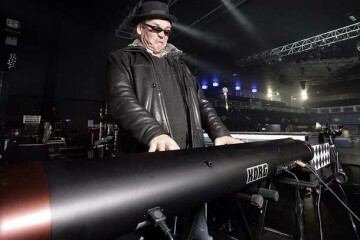 Moving on, and last week we reported on the Sandown Racecourse gig, and how Mike’s late arrived generated a real mix of reactions from those who attended. This week, courtesy of Dan Fossard, we had the full track listing (taken directly from the pinched set list). 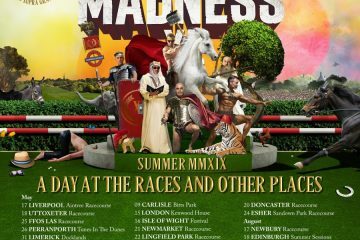 Madness Sandown Races Set List…. 18. 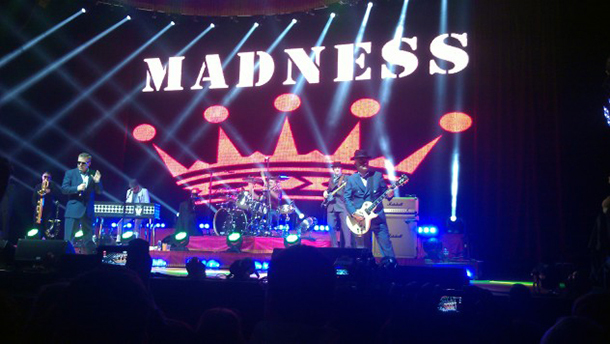 MADNESS (again!!!!) woohoo!!! twice!!!!!!!! Dan was also certain that as well as two plays of Madness another song was also performed twice, but he couldn’t remember which one it was. Pub news next, and from an unknown newspaper source we discovered that a gathering of Madness fans had managed to drink a pub dry. 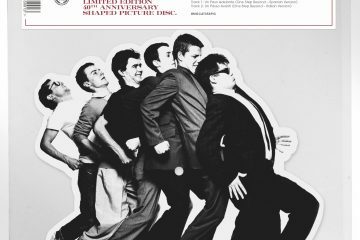 After a bit of research, and an email from Steve Turner, we discovered that it was a group of Madness fans who’d drunk the pub dry, and the band responsible for this was non other than Madness tribute, The Los Palmas 6. “Los Palmas 6 strike again !! !”, responded Steve. We brought this issue of the MIS to a sad close with the news that on Saturday 16th August Walthamstow Greyhound Stadium closed its doors after 75 years of greyhound racing. The family who had built the stadium in the 1930s with its iconic neon-lit art deco frontage had finally been forced to sell up to housing developers, blaming falling profits. Many argued though that it still had huge attendance levels, even on quieter nights, and wondered if the £31million they were offered was just too tempting to refuse! More memorably associated with Blur’s Parklife single and album than with Madness, the stadium did still have a couple of very important Madness connections. It was here that Ian Dury made one of his final public appearances hosting a VIP dinner and auction in aid of Cancer Backup. 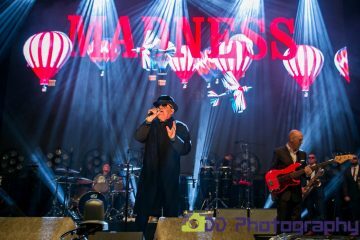 Madness provided not only the live entertainment for the night, but also fully entered into the spirit of things helping to bid up the auction takings. It was from this night that the fabled ‘Drip Fed Fred – Live at Walthamstow Dogs’ 1 track promo CD emerged and it was also on this night that Madness ended up winning an auction for a greyhound pup to be trained for racing at the stadium. ‘Nutty Boy’ as he was appropriately named went on to win a number of races. Issue 223 – Sunday 17th August to Saturday 23rd August 2003. We started off the issue with a brief announcement that the day prior to the MIS going out saw the final performance of the ‘Our House’ musical run. Reminiscing of the time when the idea of a show was first announced, we (like many, no doubt) were initially worried about the reputation of our beloved band, and how this sort of production could potentially damage the band. Thankfully, the majority seemed to feel that the show had been put together and staged beautifully, providing many Madness fans with a theatre visit they’d never forget. Who would have thought that half a decade on, the show would not only be up and running, but would be touring the country. We don’t know how he did it, but Chris Mountain managed to get the forthcoming Madness weekender into the Shropshire Star newspaper. Sure, we’ll be the first to admit that it’s hardly on a national scale, but the report was fairly sizeable and at the same time, detailed. Perhaps we’ll never know if the article helped pull in a few more punters, but one thing is for sure, it certainly gave the online Madness fanbase a rather nice plug indeed. Other news this issue included a brief review of a previously unheard of Madness tribute act, ‘Completely Mad’, courtesy of subscriber Juliet Bulmer. Juliet gave them a big thumbs up, and came away having had an excellent time. If anyone knows if this band is still doing the rounds or not, please email us to let us know! Finally, we rounded of this week’s issue with a brief heads-up to let everyone know that the official One Step Behind web site had now moved over to the new MIS Online web server. 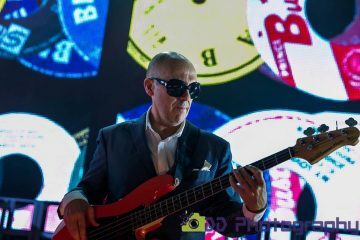 Reviews and write-ups of live gigs. You’ll find them here. 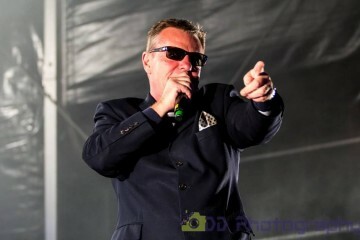 It was a gig that mostly peaked on the Saturday Night of the two day festival, as the headlining UB40 pleased the gathered masses with their own brand of reggae music. The missing lead singer, is forgotten within just a few songs, as the whole band gelled marvellously and delivered time and again with memorable and less well known songs all in a great mode, a band twice as good as I might have expected. The rest of the time there was a feeling of under populated atmosphere that made the nicely set up United Colours Festival feel more like a pleasant afternoon in a park, than an exciting billed music festival. There may have been over a thousand or more in attendance in the early afternoon, but the audience didn’t bother to even gravitate to the barrier, happy to sit in the open field or in the beer tent, a few dancing souls, some really going for it, danced next to stationary mates whereever they had seated themselves, and when the first two people did go to the barrier the band on stage were practically in a one to one dialogue with them between songs. A quip of “Danke-schoen” after the clapping following one song, lead to a front row debate about why they said that rather than thank you! It was almost bizarre the gentle nature with which the crowd acknowledged the presence of the bands on stage. Thankfully with some diehards present, Patrick C, Simon G, Looby Loo, Mad Kimbers, and Michael (Darren Fordham’s brother) we managed to set the trend right and fill the front barrier out and a little beyond with our devotion to Lee’s band, by the time they arrived on stage we had a merchandise stall side of stage running flogging the LP’s and T-shirts increasing interest, as well as making the front of stage area more busy for the 5pm show. Sadly it was the most disappointing set of the year for the band, not because of how they played, or their mood, (indeed with a little sunshine and a field of people looking on, Lee remarked “It doesn’t get better than this”) but for stage time and technical problems it was an under delivered experience. The mood of the set impressed and entertained those less familiar with the ska orchestra’s repertoire, and of the more first time seeing fans, many had a great day, meeting Lee and the band for photographs after, in an environment where the numbers were not going to get out of hand to have the time to meet every fan for a polite word. Everyone was pleased. It remains a sorry state of affairs though, that the band were practically pulled off stage two thirds through their proposed set list. Why did this happen? A juggling of bands was going on, a curfew of 10pm for the whole gig, and things were running on a little. Sadly the move to put the cockney rejects on earlier instead of The Toasters who hadn’t been told to arrive at the right changed time resulted in turning an amp to jelly in the set up, and Tadman’s bass sounds were raw on the first song and then the equipment gave up the ghost, leading to a fill in over 5 minutes and no doubt the loss of a song in the already shortened time slot. While you can forgive the removal of the band early and say Napolean solo or soul serenade not being played is justifiable in the circumstance, it was the lack of the currently playlisted on radio 2 and album lead single, Fu Man Chu, being aired that cements this set as one that was lacking. Darren Fordham had been experimenting with a melodica for the track too. The mood felt overall like an enjoyable rehearsal level affair, though at one point Lee did jump out on to the front speakers and give a nice show. 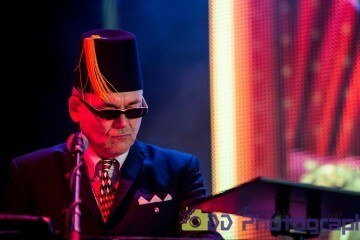 Again it’s a pleasure to see him hold the band’s LP on stage as a prop, too. Soon you’ll be gone was the last song before the forced “off”, and Too Soon You’ll be Gone is the feeling that this had on the crowd. The Sunday later peaked with the excellent Neville Staple, and everyone faded away to the mostly instrumental set of the Skatalites as dark arrived. (Or one Skatalite as Lee described the band) The LTSO I think had dropped Eastern Standard Time out of the fact the main band might do this classic. Ironically before we left the Skatalites did Bangarang, but in a version sooo different from how our boys do it, that it was more a case of spot the odd word to hear it’s the same song. The Sheffield bowl was therefore not a cup that runneth over, even though it’s contents were all great ingredients. 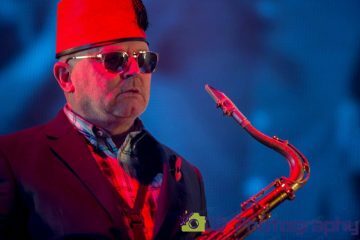 Lee Thompson took a few days to recover from his exciting performance with Madness on the Palace Square last Sunday before returning today with the side project he shares with bassist Mark Bedford, also a member of the legendary combo: The Lee Thompson Ska Orchestra. With a new recorded LP at Ironworks studio in Brighton, entitled “The Benevolence of Sister Mary Ignatius” album, he pays tribute to Sister Mary Ignatius, professor of music at the famous Alpha School in Kingston, which is were some of the best trained island musicians like Don Drummond, Johnny “Dizzy” Moore etTommy McCook originated. The set covers classic songs like “Guns Fever” Baba Brooks, “Ali Baba” by John Holt, “Eastern Standard Time” Skatalites, “Soul Serenade” Brothers of Soul, “Napoleon Solo” Lynn Taitt & The jets and a beautiful cover of “Fu Manchu” Desmond Dekker. The mischievous prankster saxophonist quickly puts the public at ease. Like a clown trying to impress at any time the viewer he climbed the metal structure of the scene, twirls his microphone like Roger Daltrey (with less precision than the leader of the Who!) And jumps on the front speakers, joking with his musicians, he dances like a puppet, in short he made the show and he does it well. Everywhere the public dance and good humor is spreading like wildfire in the aisles of the festival. Towards the end of the show the rain made a brief appearance but not that it prevents the LTSO to carve a great success before Groundation succeed him on stage at 22h before a large audience. Preview gig: Monday 26 August, Liverpool International Music Festival, Sefton Park, Liverpool. Exhibition: The Art School Dance Goes on Forever, John Lennon Art and Design Building, Duckinfield Street, Liverpool L2 5GU, Oct 19-Nov 15, SPECIAL PREVIEW: Friday Oct 18, 4pm. Open Monday – Friday, 10am-5pm (and Saturday Oct 19). Book Launch: The Non-Stop Pop Art Punk Rock Party by Paul du Noyer: Oct 18, 6.30pm-8pm. Liverpool Institute for Performing Arts, Mount Street, L1 9HF, 0151 330 3000. Free ticketshere although you will be wanting to buy that signed £15 book, won’t you? The Insight: Paul Du Noyer In Conversation with Bryan Biggs and Steve Hardstaff, Weds Oct 23, 7.30pm. The Bluecoat, School Lane, Liverpool L1 3BX. Random wafflings from Chris’ Cupboard, Twitter and Facebook. I found this very heartening image of Chas on the internet and I really love it. I hope the link works. Can you tell me when the image was shot and by whom. What a gorgeous looking young man! I’d like a poster too. Chas always had loads of cats, he gave me the maddest one of the bunch once. I think the photographer might have been Eric Watson, I think this picture is from a Smash Hits Madness book. PS this is really sad. I don’t know how I remembered his name but I just Googled and he died last year. He did a lot of stuff with us for various magazines, he was a lovely man. CB, the coloured vinyl re-releases of your first 6 albums that have just come out are a joy to behold. Really well packaged and great collectors items. Just wondering, on this and the other recently revived re-releases, how much input and influence you and the rest of the guys have ? Keep on keeping on ! Ah right – I had forgotten about them. Not much input, other than approving the artwork. The English composer and musician Cathal mo Chroí, aka Chas Smash, best known as the co-frontman and multi-instrumentalist inMadness, will begin his solo career in 2014 with the release of his beautiful, moving debut album A Comfortable Man. Cathal will be revealing some of this solo material for first time at FN6, accompanied by strings and harp arranged by Joe Duddell. 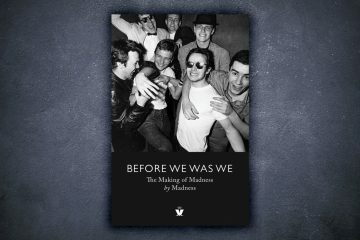 “Chas Smash came from the days before Madness was a band. When we were a gang of friends and one of our pursuits was that we used to spray our names on walls etc. Chas Smash was my tag, Mr B Mike’s Kix Lee’s Chris’s Chrissy Boy’, Graham, Woody & Mark came along later when the band started. My birth name is Cathal. MEANING: cath ””battle”” and all ””mighty”” and signifies “”a great warrior.”” Cathal is the Gaelic for Charles hence the tag abbreviation of Chas. Mo Chroi is Gaelic for “My Heart” and my reason for using this is to define this project as being separate from Madness to aknowledge my Irish heritage and in turn to indicate the personal & “Heart” nature of the songs. Carl was also shown a fan’s video of a budgie singing the intro to One Step Beyond! Before we go we’d just like to remind you that if you’ve not already entered the competition over on the official Madness web site to win 52 bottles of Gladness Ale time is running out. 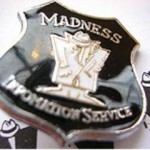 Simply pop over to: http://www.madness.co.uk/2013/08/09/win-bottles-of-gladness/ and once there submit your details. There are 4 runners-up prizes, each consisting of 8 bottles of Gladness. The competition ends on August 31st, and you must be 18 or over to take part. And finally, if you want even more chance of winning yourselves some Gladness don’t forget that the MIS’s very own “Name The Elephant on The Bottle” competition is still running. As you’ve probably guessed, all you need to do is name the elephant that appears on each bottle of Gladness. Bedders will be pulling the name out of a hat, and if you win you could be in with a chance of bagging a t-shirt, some Gladness ale or a Gladness pump clip.